Closed Webinars vs Open Live Streams! For building relationships and helping the most people, how do open live streams on websites like Dlive, YouTube, Facebook, Twitter, or Twitch compare to closed webinar formats with things like GoToMeeting or Zoom? I will show you and you can decide although to be honest I am way biased in favor of open sharing after having done both. Closed Webinars vs Open Live Streams for Teaching and Selling? I've done almost all my live streams in the open. I've done a live stream with GoToWebinar. I've done a live stream with some other closed thing, Google Hangouts or something like that, and I've done some live streams to a private Facebook group. Now, let's show you the data. These are all of my videos on YouTube. What you will notice is that there is a bunch of these live videos that have a lot of views and a lot of engagement that came from live streams. Here's one I live streamed. It's a gaming video. I've got live streams all over the place that are tutorials. Here's a live stream Facebook tutorial. If I keep scrolling down, here's a live stream cryptocurrency tutorial. A lot of these live streams I've done have gotten thousands of views even years after I did them. Now, compare that with a webinar where if I just did the webinar and only the people who came to it could watch it, I would have got a fraction of the total results. Here's a live stream I did on Facebook ads, "Free Insider Facebook Ad Training." 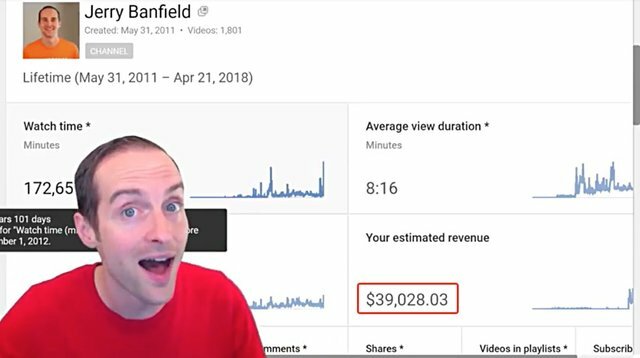 I show the best of what I learned doing Facebook ads over two years completely for free on YouTube. I've got thousands of views on this video. I did the same thing with Poloniex. I've done a ton of different live streams on YouTube, Facebook, Twitch, Twitter and Dlive. I've done a bunch of different live streams and it works way better than doing closed webinars if you actually know what you are talking about and you are proud to present it, and you want people to actually learn from what you have to say without having to pay you. In my opinion, the main motivation to do a closed webinar is fear. You are afraid that you are going to show everyone what you know. You are afraid that you won't make any money by showing people what you know. You are afraid that if you just do it on live you will make a mistake on YouTube or something. You are afraid, afraid, afraid. If you go forward in love and courage, it seems like by far the best option is to do it wide open. If you want some more data, let's take a look at a few different data points. This is my Thinkific website, which is what I use for my course hosting now. I've not put a lot of effort into promoting this and I earned $40,000 in revenue, nearly all of which is profit. Now, that's a small part of the total. If we look at YouTube, over twenty-one million views, and $39,000 in ad revenue. A lot of the ad revenue was a result of live streams, that then later had ads on them and got watched and helped people discover my video tutorials. 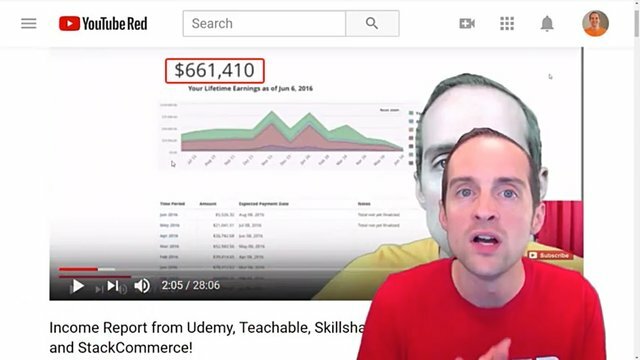 Now, the most money, Udemy with $600,000 earned. A bunch of the course sales were a function of my live streams. 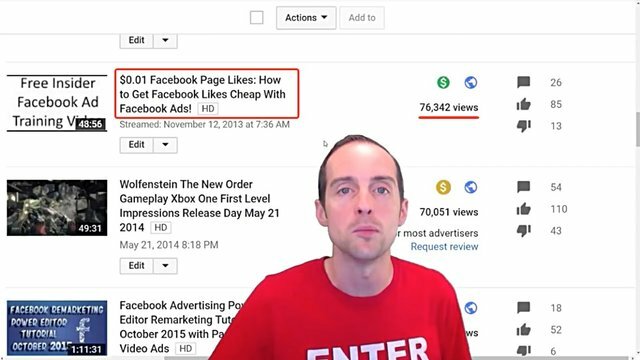 I did live streams on "Facebook Ads" years before I joined Udemy, and then the first course I got that sold really well that inspired everything else was a "Facebook Ads" course that was based on my live stream. 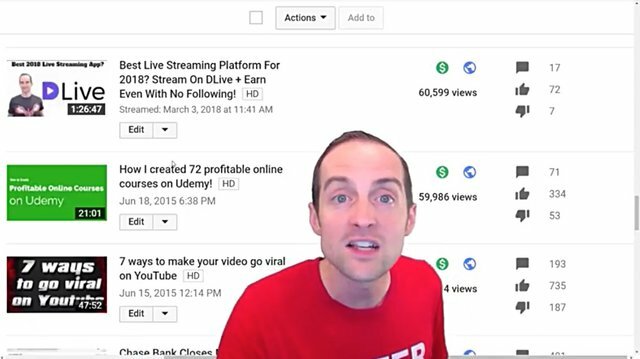 Literally, the first course I uploaded to Udemy was a live stream recording. 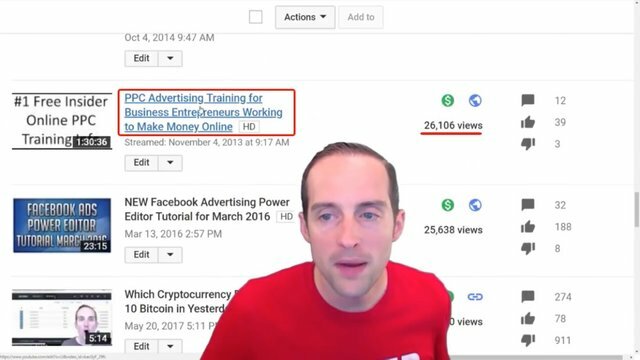 A lot of the people who bought the course on Udemy saw my live streams training on Facebook Ads. 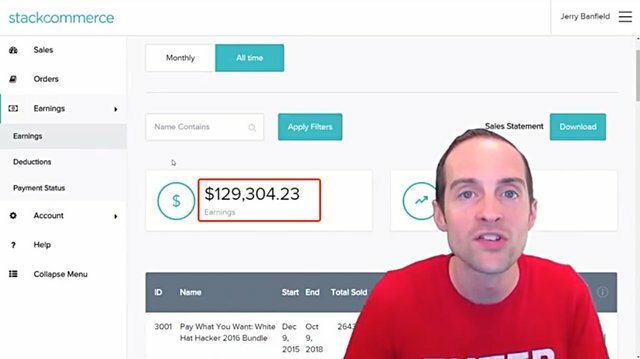 A lot of the sales on StackCommerce are coming from things that I originally live streamed, and then I put into a paid video course. Now, if you think that doing a paid webinar or a free closed webinar is a better way to do it, here's another data point. In six and a half years of doing business online, I have never once ever went to someone else's webinar that was not on a platform I already used. I went to a webinar for Udemy instructors hosted by Udemy.com on Google Hangouts. I never once have been through someone's squeeze page and join their webinar, despite seeing hundreds, if not thousands of them, despite advertisers paying to get me to see it, not once ever have I went to someone else's closed webinar. Because I'm not interested in going to someone's sales pitch, which might show me a few tips, and then getting sold some course for several hundred dollars that only happens to be available for free. I'm not interested in having to be online at a very certain time to watch a presentation that you could record and put it up on YouTube that I could watch whenever I wanted to, and that other people could watch for me, and then they could decide whether it was worth watching for me or not. What's amazing about these free platforms is that other people help essentially review the webinar. Why the hell would I want to go to your closed webinar when I will go watch someone else's on YouTube that people have validated with lots of views, comments and likes, and maybe invalidated with dislikes? I don't go to anyone else's closed paid webinars. I hosted a few of my own and I even had 20 or 30 people come to them. The sales were abysmal, and then after doing that webinar, sure I could upload it after the fact and put it on YouTube, Facebook or Twitter, but it's not the same as just doing it live. 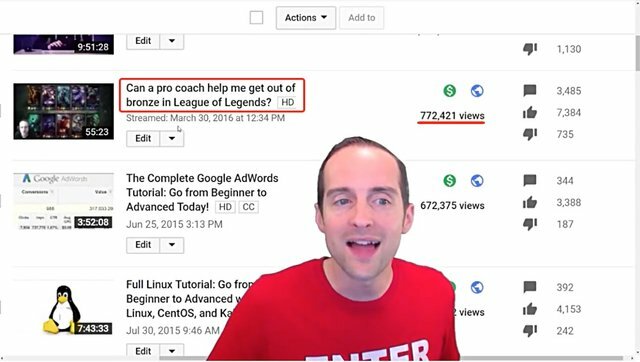 We can get massive audiences by doing our live streams in the wide open on YouTube. If you are going to spend all that time, energy and effort to get people to watch, why not just put it up on YouTube and Facebook for free and allow anyone to come join in it? Fear is the only good reason not to do that. If you are afraid, then there are lots of reasons not to do that, and if you just genuinely have something useful you want to share, there's no reason to put it in a paid webinar, let anyone come watch it. There is no reason to put it in a free webinar and require someone's email address before they watch unless, in my opinion, you want to exploit them. Let people come decide for free without giving you anything, not even a like. There have been people who have loved my live streams and learned from them and they have never bought anything from me, they have never said anything to me. I know this because a lot of people who now are collaborating with me, who are partners, who have shared lots of my videos, who have bought my courses, who have paid for consulting, have told me consistently the same thing. "I watched your videos online, and then I bought your course." Or, "I bought your course because it was reviewed very well." 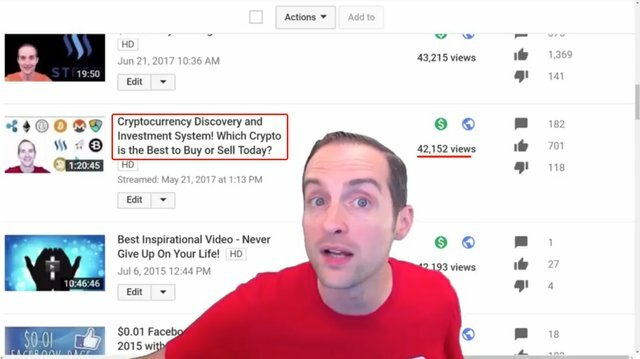 It's very easy to sell a video course indefinitely when you do live streams especially on YouTube. On Facebook, a live stream can also be very effective to sell a course, but what a lot of us may get caught up on is impatience. 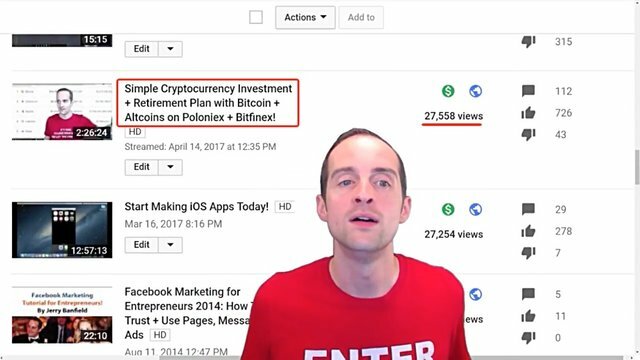 I did live streams with cryptocurrencies for about a year before anyone bought a course from me on cryptocurrencies. I first just did it to test it out, "Hey, look. Here are a few things I learned." 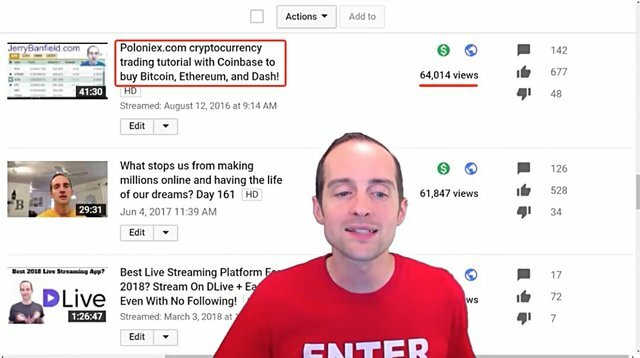 Once I started doing live streams promoting a cryptocurrency course I made, a lot of the Thinkific sales and a lot of the ad revenue on YouTube, a lot of the StackCommerce earnings came from people watching the live streams, buying the video course and wanting to see everything in detail that I was talking about. Live streams on Facebook can do a really good job of getting friends and family involved. You can get a niche audience with live streams on Twitch depending on your topic, You can get one or two people at least to come stop by your live stream even with no existing audience, if you are teaching something that's genuinely useful. There's not a lot of live streams that I've seen like that on Twitch. A lot of these things I live streamed, I could have easily done a paid webinar for, and the beauty of it is some people will watch a live stream on one thing, and then come back for a completely different topic. Now, you can also build an email list alongside this. If you have got an email list, I think it's much more effective to promote the live stream available for free because it's easier for people's friends to get involved. 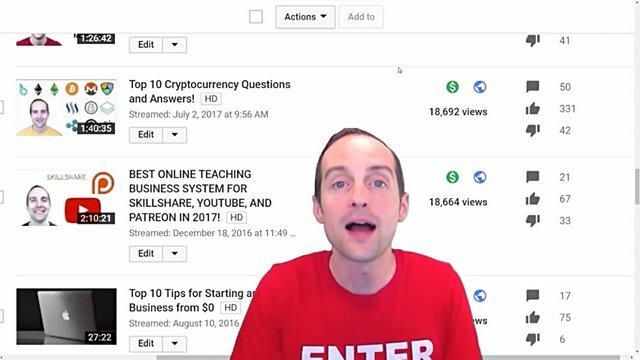 If you are afraid of people forgetting about the live stream, you can ask them, "Hey, would you sign up for my email list to get notifications when I'm live on YouTube, Facebook or Dlive?" or wherever you are live streaming. You can do all of the same things and yet you can make it open and available indefinitely. You will notice that some of these live streams I did are from a long time ago — I say a long time ago, not in the grand scheme of things — like I live streamed this over a year ago and over that year more people have watched it on YouTube as a video that was a recorded live stream, but I streamed it live on YouTube. Over the years since I've filmed this more people have watched it after it was over than watched it originally. Now, if I'd done a webinar that you had to sign up via email and a squeeze page, if I'd done it that way, then I still could have had the original maybe 5,000 views. Would I have got that many views if I had to promote it? But I wouldn't have gotten the twenty thousand plus views over the next year afterward. It's the same thing with this "Pay per Click Advertising" video. Most of the views came afterward. Even if most of the people didn't engage with it, that's an opportunity to get back in the newsfeed again, or to get back in the recommended videos again, or to get a completely new audience to discover it. In my opinion, doing paid webinars or webinars that you have to sign up is a complete waste of time. When you have got a message that's genuinely helpful to share with people, when you want to show someone how to do something, just put it out there for free. If you have got something you want to sell, do it in the free webinar that's out in the wide open. You can use things, if you want to get a lot of other people talking, you can get them on Zoom to talk with you. You can have a bunch of people all talking at once on Zoom. You don't need some webinar platform to give everyone the chance to participate. You can just do Zoom and live stream your Zoom out on YouTube, Facebook, Dlive or wherever you want to live stream. You see that when you do it this way, you have got a chance to reach a lot more people. You have got a chance to make a lot more sales and you get rid of all those fake barriers. When you try to do something like a closed webinar where you have to sign up via email and you have to go through, and then show up at a certain time, what you don't see is how many people you are losing through that process and you get sucked into someone else's funnel of having to promote things a certain way. Then, you have got to get people to sign up for your email and your webinar. You have got to promote it and often this requires advertising, whereas if you just repeatedly do this on YouTube and Facebook for free, you won't have to promote them anymore. I don't have to spend money on ads promoting my live streams now. A lot of the live streams had hardly anyone watched them at the time, and yet thousands of people often watched them afterward. The free option is so easy that most of us just think it can't work. Now, there's also another roadblock. 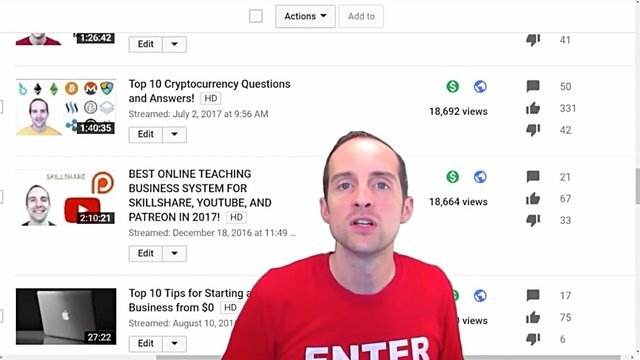 If you have been to someone else's live stream and they suckered you in and sold you a $500 course with the same information you could have found for free, if you looked for it on YouTube or Google — it happens. I bought someone's $500 course just because I liked them and they offered a free call. I literally could have googled the same information I got out of the course. I liked the guy though and I still have credit for my 30-minute call with him and that was not through a webinar, that was through a friend recommending me to it. What I've noticed is a lot of my friends that work online have been drawn into these webinars, have been sucked into them and they have bought something, often spent hundreds sometimes thousands of dollars, and then they have got the idea that they can do the same thing. It's not that easy. Often the people who have sucked you into going through their process, you can't repeat that process on other people without spending hundreds of thousands of dollars, without having often products and services not genuinely helpful that cost a lot that are easy to trick people into buying or without having some built-in affiliate system, which makes money in the middle on lots of emails. You don't often see the entire system if you are going through someone else's. You don't see their whole business setup, and then you think that it's easy to just do this yourself. I've never seen one of the people I've worked with on a consistent basis successfully repeat it, not once. I've seen a lot try, a lot spend money on software, a lot try to get people to sign up, and you know what they tell me, five people came and no one bought anything. 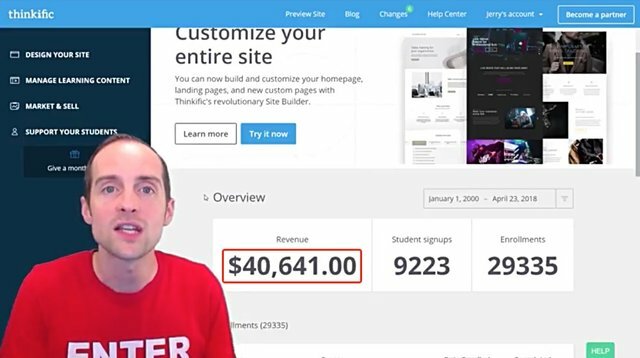 They spent hundreds of dollars on ads, they spent hundreds if not thousands on webinar software, they spent more money on graphic designers, they spent a bunch of time trying to do the presentation, five people came, no one bought. You have got the data here for you. You want to go create a squeeze page and get people to go to your sign up only webinar? You can see the results I'm getting. I appreciate you reading this. I've shared this because I hope it saves you a bunch of time and energy doing things in a way that's proven to be extremely effective for me and in a way that's transparent. I'm showing you the system I'm using out in the open. You can see it for yourself. You don't have to guess about it and you can see that it's cumulative. Now, sure, you can do closed webinars and those are cumulative if you keep building your email list, but they are not cumulative in terms of naturally syncing up with everything else you are doing. You always essentially have to sell people on going to another webinar, whereas with this, I don't have to sell anyone on watching another of my live streams. YouTube, Facebook, Twitch, Twitter, Dlive and Steem, all do that for me. All I have to do is announce it and say, "I'm doing this," and people show up every time. There's somewhere around twenty to a hundred people who come watch every live stream I do. That's after two years of live streaming. I don't need ads. I don't need to promote it. That said, there might be one special case somewhere where you can't show something because it's illegal or you have got this super-secret, occasionally, sure. I realize it works for other people. This is what works for me, so there you go. Facebook page with 2,260,298 likes. YouTube channel with 234,900 subscribers. If you want to stay updated via email, will you sign up either to get new emails daily at http://jerry.tips/steemposts or join at http://jerry.tips/emaillist1017 to get an email once a week with highlights? If you would like to build a relationship with me online, would you please visit https://jerrybanfield.com/contact/ because I would like a chance to get to know you? Our Most Important Votes on Steem are for Witness! If you do not know what a witness is on Steem, will you please read https://steemit.com/steemit/@gmichelbkk/what-is-a-steem-witness-how-to-vote-and-why because our votes for witnesses determine our future together here on Steem? If you want to fully participate in witness voting and have never made a vote before, will you please set me as a proxy at https://steemconnect.com/sign/account-witness-proxy?proxy=jerrybanfield&approve=1 because this help me to make all witness votes on your behalf and keep them updated? If you already have voted for witnesses and prefer to update your own witness votes, will you please place your vote using https://steemconnect.com/sign/account-witness-vote?witness=jerrybanfield&approve=1 because you will feel good knowing your witness vote is helping fund projects that grow Steem as explained here? Thanks for your great helpful advice. They’re really long read! ;)) But time well spent. Open Live Streams. I like Steemify and the idea of notifications. I've done an analysis of live streams for a few years now. Before LiveStream was infused with fund a friend and I were thinking about getting into business. We had conflicts in content types. I was thinking of what was missing at the time. Where live broadcasts on DLive are hovering around today. Personal broadcasts that are wholesome. My potential partner was still interested. But, we never ended up getting into business due to excessive expenses and shoe string budgets. Since, I've broadcasted for countless hours. #1 election day 2016 Periscope with automated accounts providing me with that information. That day was hard work all the way around. Scheduling posts on social media like Facebook. 25 websites at max on a cPanel with a large number of subdomains hitting Facebook with #'s galore on the day of election. To replicate that style buzz is possible. The broadcast at the time was "good playing time." Take The Trump Train song during election day. Activating the audience is where I see a lot of great broadcasters excel. Asking for shares upvotes etc. Consistency... Like your 9PM pitch is something that sounds interesting. I can't afford partnership atm. But, it's something I would be curious to listen in on. Consistency, next day, about the same time. Broadcasters and influencers are like friends to some of us on the homestead. Every service has something different to offer. I broke the ice with my music on YouNow. It was a cool site. But, I didn't feel that all my efforts in driving traffic to the site were working. Opening streams to posts with thousands in registration on FB pages etc. I came to find that engagement percentages are various. Getting someone to click in and on isn't easy. But, if you have that style magic, and make the engagement with a great cover, it's as good as clickbait. I know that most social media is all about community. The community is very nice. But, I went to Periscope to give it a try after witnessing a hacker create twitter bots to bolster views. I actually tracked the hacker and asked him why he would do it. He said the girl was heavyset. But, no less beautiful. She worked extremely hard. But, never trended. I reported it to the YouNow via report. But, who knows who handles those reports? I searched hack and younow in a few different ways and found public videos of exploits. I'm not a hacker so to speak. I'm not an unethical hacker. My hack is more journalism and SEO in tandem multiplied by good playing time. On Periscope before long I had a 1K broadcast and it appeared my efforts in websites, shares, etc were working correctly. I decided to stay there and appreciated the map feature. I liked being able to go to the hot spot to catch the breaking news filmed by people holding a cellphone. I wish DLive had a mobile app because I would be all over it. OBS + Cover is a little more tech savvy for most of the live broadcasters I've watched. Which is positive and negative. Great because those with ability are usually fun to watch. Negative because you have to go through extra steps to get your broadcast on. OBS applies tools that can be fun too. *Let me not get to far away from my the answer to the question of preference. Open live streams for me personally. (I put a star there because as I'm writing I'm apologizing for lengthy comment after coming to find this from your Discord which the point was to emoji posts I might resteem. Long story short. Notifications like Steemify ability are interesting features. Mobile app. Mapping ability. Those things are really nice to consider. I have never been to a closed webinar outside of previous employ when learning the tax resolution business. I like DLive because of the crypto reward factor. I do music. But, no covers. My live stream depends on genuine fanbase beyond good playing time. I'm happy to make the Music tag on DLive my new home sooner than later. It's hard to do a lot of work on something only to have it stripped. My periscope was suspended. I watched as Trump supporters had the same happen and I can name a few in VeganCheetah and BakedAlaska. The channels we build are valuable obviously. And, we come to find our control is limited. What's the best format to stream on depends on the broadcaster. I liked Steemit because I knew my websites can direct traffic where I provide the links. I also like Steemit because it's new. I started with Twitter around 2012. Twitter suspended the account after 60$ in superhearts earned. Cash at 100$. They also comforted a person that's mentioned in my posts. I'm a unique case. I hope DLive is the right place for me and I think it can work. I see the Music tab is empty and like to fill the area. I notice my stream view count is up under the music tag opposed to the gaming tag. 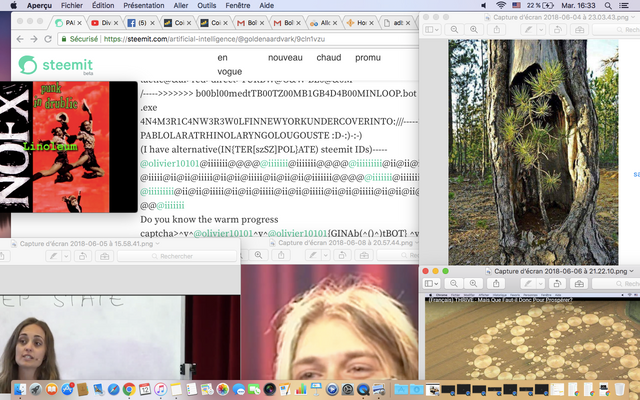 Open live streams can get amazing with high volume and comments galore. I'm a speed reader. It's why I figured I would look into the discord. I apologize for the lengthy comment. Open Live Streams simply put. Getting broadcasts lit as possible, or high volume view as possible, is the fun for me personally. @jerrybanfield as always you inspired me a lot again. this post is very much encouraged me and i also appreciate you work. you always show us very unique post and give many ways for developing our earning method. you are really awesome. i love this work very much and you too. pls help me to guide such a way. and help me by vote my post. thanks. i always vote your post. .carry on brother. . I can understand how much pop star you are becoming day after day, but I can not understand why you are so mean and you do not upvoting your fans and their comments in your posts . . . .
No No ... do not understand me wrongly.... I still love you ( in arabic world is equal to like you in your world terminology ) ,,, but this question is buzzling in my head since you have joined here and developed by support of young minnows and how you hired many IT staff to make your BOt and still you are so mean !!! WHY ?? @red-rose with my account as a voting bot, I am not able to upvote comments and I appreciate you sharing here! Thanks for these helpful tips. I'm a newbie in media marketing and i'm taking the course on Edx. I'm sure following you on the other platforms you mentioned. Great insight on one of the most overlooked ways to create and share online and you are totally right, we are "afraid", I have never tried livestreaming before but you sure inspired me to give it a try. Thanks @jerrybanfield I will check your youtube channel. @gabrielkrupaz you're welcome I appreciate you letting me know that because this was my main purpose for sharing! You're very good at what you do.. So keep it up Jerry! @mugishajc you're welcome and I appreciate you letting me know that here! I upvoted your contribution because to my mind your post is at least 39 SBD worth and should receive 388 votes. It's now up to the lovely Steemit community to make this come true. hello @jerrybanfield you have thought about making tutorials for the spanish-speaking community. @lsanchez920 if I spoke Spanish I would! @goldenark you're on the @abusereports naughty list!